There are places online where you can purchase kits that contain all the materials you need to make your own Latex monster masks. I'm sure these are fine products, and if you've never done this before there's nothing wrong with going that route. However, if you don't mind doing a little scrounging, and if you trust your own creativity, then you can make three to five latex masks for around $50. By the way, this project isn't intended to make masks that can be worn. Instead, stuff them with newspaper or expanding foam and mount to props. 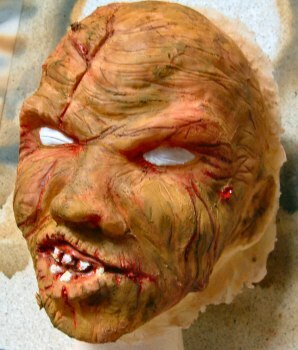 Making your own monster mask is a very rewarding experience. The girls will think you're all sensitive when they learn that you're "sculpting" and learning how to make your own molds. 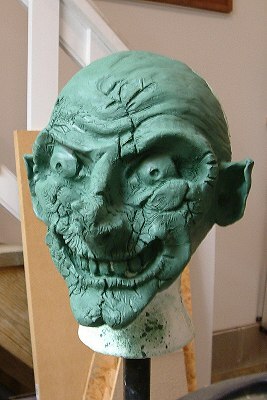 That is, until they see the vile creature you're actually sculpting. 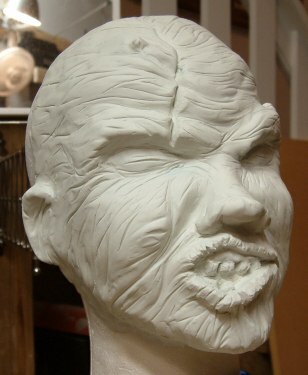 The entire mask making process can be broken down into the following steps: Sculpting, molding, casting, and painting. There is a fair amount of work involved and you will need patience (especially when you destroy your first mold trying to de-mold it and have to chuck the whole thing into the trash). Don't be afraid of failure. Especially since clay and plaster are really *cheap*. Luckily, the hardest part of the project involves the cheapest materials. 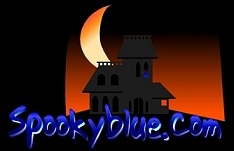 By the time you start working with the expensive stuff (Latex), you'll already have your mold ready. This isn't really a sculpting primer. 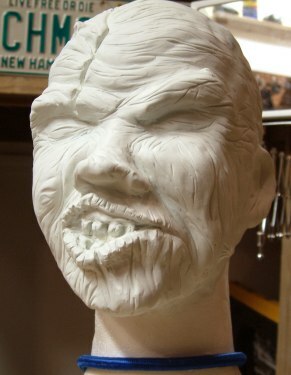 If you've never sculpted before but you aren't afraid to jump right in then you should be able to follow along. If you'd like more information about the how's, and why's and where-fors before sinking your fingers into some clay, then click here. Plastiline (Plastilina) clay won't dry out. You can work it and reuse it indefinitely. 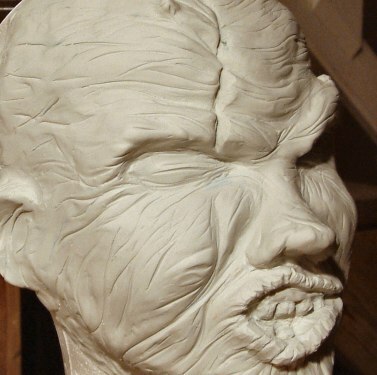 Start your project by covering your styrofoam head (or whatever armature you're using) with clay. Knead handfuls of clay and mash them flat, then just squish them in sections all over your head (the styrofoam head, that is). Your goal is to cover the surface with somewhere between 1/8" to 1/4" of clay. I only covered the front half of the head and I recommend that you do the same for this project. We're only making a single-part mold (just the face), so don't go back any further than the ears. 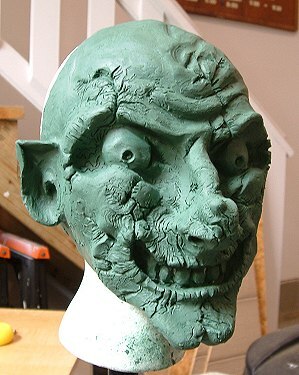 My first feeble attempt at sculpting was the "green goblin" shown below. He didn't make it past the mold stage and got chucked into the trash. 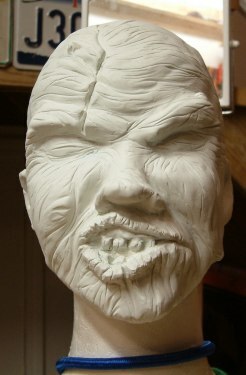 I changed clays (to Plastilina from stinky sulphur) and started over from scratch, taking time to pay closer attention to how the face is built. Use a mirror to get ideas about where things belong on your face. Don't bother measuring anything unless OCD compels you, and if you can't figure out how to do a particular bit, just have fun and make something up. If your neighbors don't already think you're crazy, sit in front of a mirror in your garage and sneer at yourself for a day or two.